I never intended to purchase the Fujifilm Instax SP-2 printer, or as it is known on Amazon, the NEW Fujifilm Instax SHARE Smartphone Printer SP-2, when I visited the store the day before Thanksgiving. Don’t get me wrong, I’ve been eyeing the SP-2 for several years, and the SP-1 before that. I’ve even gone so far as to pick it up, carry it around the store, only to return it to the shelf prior to checking out. I suppose I could never make a case for why I needed it, other than it was cool tech. Another reason was price. It always seemed to be just a bit too expensive. Well with the release of the Fujifilm Instax SP-3 (larger print size) and a whole line of Instax cameras, the price has been coming down. So when I saw it on a shelf last week for $90.00, and armed with a 20% coupon, I finally pulled the trigger and purchased it. Before I continue with how incredible this product is and how I have already put it to real-world use, let me explain exactly what the SP-2 is for those of you who may also need to find a reason to get one. The SP-2 pairs with your smartphone via the Instax SHARE app and lets you print any photo to Instax mini film. And just like the Polaroids of the past, or present, all you do is wait a few minutes for the film to develop and you have a 1.8” x 2.4” photo framed on a 2.1” x 3.4” card. Perfect for sharing. When I was in New York City for the Photo Plus Expo the first place I visited was the Fujifilm Wonder Photo Shop located at 176 Fifth Ave., right across from the Flatiron Building. If you want to explore the entire Instax lineup in one place, this is it. With most Fujifilm X cameras, you can also print directly from your camera without going through the app. The only disadvantage is you lose the ability to edit your photos or use any of the features offered in the smartphone app. Additionally, through the app you can sync with Facebook, Instagram or Dropbox and print those photos. Finally, you can always print photos from your DLSR or computer hard drive, you just have to move them to your phone first. A few other observations before I get on with my story. It is smaller that I expected, which makes it easy to add to your camera bag. There are also many options when choosing film, including monochrome, black frames and frames for all kinds of occasions. Speaking of film, or the real question, what is the cost per print? Your best bet is to purchase twin packs, which gives you two packs of 10, or 20 images total, for about $.80 a print if you shop around. Back to my story. On the day after Thanksgiving I visited my 94-year-old grandmother at the Masonic Village just outside Philadelphia. After chatting for a while she asked if I had my camera with me because she wanted me to photograph a friend who was only a week away from her 100th birthday. I grabbed my camera and made a half dozen photos of her friend and also a few photos of them together. Just as I was promising to send her some prints, I suddenly remembered the new Instax printer in my backpack. You can imagine the surprise on my Grandmother’s face as I printed a photo of her friend and another of the two of them. Then printed duplicates. Instant satisfaction and instant smiles for all of us. In that moment it hit me, just how powerful a tool this printer is. And it took me finally purchasing one to truly realize it. From left: The Fujinon 16mm, f1.4; 50mm, f2.0; 35mm, f2.0; 23mm, f2.0; and 18mm, f2.0. I'm not sure how it happened. Of course, it started with one lens, the Fujinon 35mm lens which I purchased at the same time as my Fujifilm X-Pro2 camera. Then the desire to go wider, combined with a rebate, led me to purchase the Fujinon 16mm lens. Somewhere along the way I became aware of the Fujinon 23mm lens, followed closely by the Fujinon 50mm lens. Now I've acquired the Fujinon 18mm lens. That's when I realized I might have a problem. Or more accurately, a dilemma. Even before this recent acquisition, I was looking to pare down my lens lineup. But which one would go. I was leaning towards the 35mm, however, with the addition of the 18mm, does that mean the 23mm is the logical choice to go? The Fujifilm 50mm, 35mm and 23mm lenses are all f2.0 and are sometimes referred to as Fujicrons, a nod to Leica's Summicron lenses which also have an f2.0 aperture. I've also referred these three lenses as the trifecta. But the 23mm, along with the 35mm and 50mm make up what some call the "Fujicron" lineup, a nod to Leica's Summicron lenses. In this case, the Fujicron lenses are all sharp, lightweight, sturdy and do provide an acceptable range of coverage. I also previously wrote about how the Fujinon 23mm was possibly the perfect X lens, or how the 50mm completed my kit. Before I go any further, I should mention that I've decided the 16mm will stay. I've written about it before and while it is a bit heavy and large for everyday carry, it is absolutely my go-to lens for landscape photography. Table and Chairs, Memphis, Tenn., 2018. Fujifilm X-Pro 2 with Fujinon 18mm lens, 1/125 @ f5.6, ISO 200. So, what about the 18mm? I love the compact size and it's the first Fuji lens I've purchased that came with a usable lens shade out of the box. On the negative side, it's a noisy lens and a bit slow when focusing as compared to my other Fuji lenses. It also doesn't have the same build feel of the other Fuji lenses, yet it doesn't feel cheap either. Obviously, I need to shoot more with this lens before I make a final decision. If you're reading this and have an opinion, I'd love to hear it in the comments. And if you haven't realized it yet, I probably won't part with any of these lenses. What's the point? Unless, of course, another lens catches my eye. 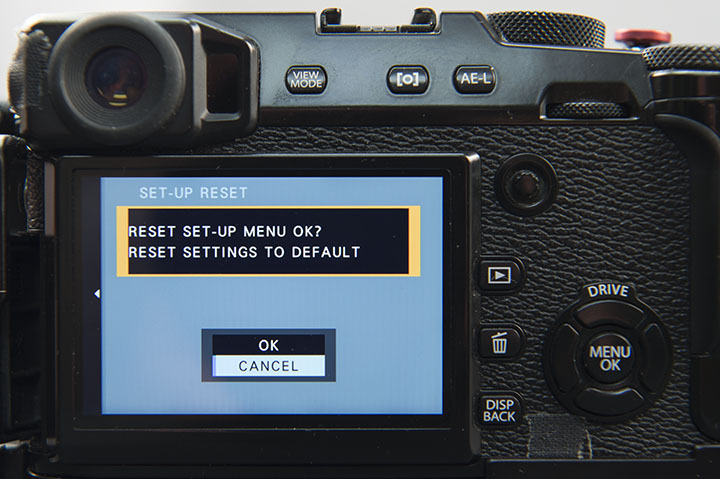 Select USER SETTING > RESET in setup menu. I think it is important to hit the reset button once in a while. Start over. Take a step back. Evaluate. Creatively or technically. In photography, it's popular to say that it isn't about the technology or the camera, it's about the creativity. Sometimes, however, the technology can affect the creative. I've been shooting with my Fujifilm X-Pro2 for nearly two years. Shortly after receiving the camera I wrote a blog post titled: "Fujifilm X-Pro2 Initial Settings," and that was also the last time I took a deep dive into the entirety of the camera's menu system. During the past few months there have been several occasions where I was seeing the photograph, but struggling with capturing what I was seeing. It seemed to be a case of technology getting in the way of the creative. Something that I never experienced before with the X-Pro2. Over time a camera setting or two can get changed, new features are added via firmware updates (4.01 as of this blog), and before you know it, it's possible the technology no longer matches the creative. Or matches how you're used to capturing the creative. Did I change or did the camera? I felt myself falling out of love with the camera, but I wasn't ready to get divorced. The X-Pro2 is still a top of the line camera and I see no reason to leave; maybe I just need a little marriage counseling. A reset button. So with that in mind, I reset the camera to its factory defaults. A fresh start. Next, I opened the manual and went through every setting as if I had just purchased the camera. Lastly, I revisited that blog post from 2016 and compared those settings to what I had just done. Surprisingly, they matched up, with only one exception. I now use both Electronic Shutter (ES) and Mechanical Shutter (MS) depending on the situation. Most notably when using an electronic remote cable release, the camera must be set to MS. There is no need to run through the initial settings again, you can go back and read them, however, I do want to talk about some choices I made that weren't available in 2016 when I wrote that initial blog post. 1. Copyright info in EXIF data. This allows you to register the photographer's name and the copyright holder's name in advance so that the camera automatically adds the information to EXIF data for each image. I take the opportunity to add my email address instead of using my name twice. 2. Addition of "Eye Sensor + LCD Image Display" in the View Mode. This isn't an option I use all the time, but it does have some advantages, especially when shooting landscapes or if you need to compose a photograph while holding the camera away from your eye. 3. Voice Memo function. While not available during shooting, this function allows you to record a 30-second voice memo while in the playback mode. This is useful if you need to record a name or something special about a photograph without having to write it down. Maybe, in the end, this is really more of a creative reset and I'm using the camera as an excuse. Nothing wrong with that. Finally, another new feature now available is support for backup/restore of camera settings via FUJIFILM X Aquire. In the future, if I want to reset, I will no longer have to return to zero, I can just return to my proven settings that match my shooting style. DOES THE FUJINON XF50 LENS COMPLETE MY KIT? Cherry blossoms in Washington, D.C., taken with the Fuji X-Pro2 and a Fujinon XF50mm F2 R WR lens at 1/80 @ f2.8, ISO 200. I recently purchased the Fujinon XF50 F2 R WR lens, my fourth Fuji lens since I purchased the Fujifilm X-Pro2 mirrorless camera in March of 2016. Why should you care? First a little history of my Fuji lens purchases. I initially purchased the Fujinon XF35mm F2 R WR lens at the same time as I purchased the X-Pro2. That lens decision was mostly based on using the 35mm f/1.4 for seven days with an X-Pro1 in New York City which I wrote about here. I liked the 53mm equivalent focal length and on this f/2 version, I was drawn to the smaller form factor and weather resistant features. Well, it didn't take long for me to realize that I wanted something a little wider. I was leaning towards the Fujinon XF16mm F1.4 R WR lens but at the price, it wasn't going to be an impulse buy. However, when I received an offer for $300.00 off, I couldn't resist. I wrote about the 16mm (24mm equivalent) here, and while this a super lens, it is just too big for everyday carry. It does get used as my primary landscape lens, however. Fujinon XF50mm F2 R WR lens at 1/500 @ f3.6, ISO 400. You may see where this is going. After a year shooting with these two lenses, something was still missing and I couldn't put my finger on it. I really liked the X-Pro2 but just didn't seem as satisfied with my photos as I when I was using the Fujifilm X100s. Could it be as simple as the focal length of the lens? The X100s has a fixed 23mm (35mm equivalent) lens and I just never missed having another focal length when carrying that camera. In August of 2016, Fuji released the Fujinon XF23mm F2 R WR lens and I thought that would finally be the answer. In fact in my previous blog post, 'Did I Finally Find the Perfect Fuji X Lens? ', I attempted to answer that very question. And I think I did a pretty good job of justifying that purchase. And if that lens had been available when I initially purchased the X-Pro2, I probably wouldn't be writing this blog post now. In January Fuji released the aforementioned 50mm (70mm equivalent). This is a focal length I didn't think I would need or want. However, after several outings with it, I'm convinced that it will get used second only to the 23mm. Fujinon XF50mm F2 R WR lens at 1/17 @ f2.8, ISO 200. It also completes what I'm calling the trifecta of lenses, the 23, 35 and 50mm. Others refer to these lenses as the 'Fujicron' line-up, a play on Summicron, a term Leica uses to designate lenses that have a maximum aperture of f/2. Whether you refer to them as the trifecta or 'Fujicron', they are all f/2; lightweight, but solidly built; small and compact; weather resistant; sharp and all match perfectly with the X-Pro2. Another real bonus is you can own this trifecta for around $1200.00 total and that makes a real nice set of glass to couple with whichever Fuji camera system you shoot with. My only complaint is the lens shades that Fuji ships with the 23 and 35. The 50mm lens hood is acceptable, but I did break down and buy the Fujifilm Lens Hood for XF35 from B&H. At $59.99 it is a little pricey, but the good news is that it also fits the XF 35. So, why should you care? Don't make the mistake and impulse buy lenses. Take the time to think about the type of photography you do and what a new lens will add. I would be perfectly happy with just the 23mm and the 50mm if I could do it over again. DID I FINALLY FIND THE PERFECT FUJI X LENS? This was the first scene I came across as I found a position near 6th St. on the Mall. The Naked Cowboy is cliché, but that's in Times Square, not D.C. Plus who could pass up the word Trump emblazoned across his Fruit of the Loom underwear. Fujifilm X-Pro2 with a Fujinon XF 23mm f2 R WR, 1/90 @ f2.8, ISO 200. It has been a little more than a year since I've been shooting with the Fujifilm X-Pro2. It has also been a year since I've been searching for the just the right lens to pair with this exceptional camera. I originally purchased the Fujinon XF35mm F2 R WR lens and soon realized that I wanted something a little wider. Welcome to my next lens, the Fujinon XF16mm F1.4 R WR. The 16mm is a great lens, very sharp and I've used it many times, mostly while photographing landscapes. But, as I noted when I wrote about this lens, it is just too large and heavy to be my everyday lens. When I went to the 2009 inauguration of Barack Obama I was about a block farther away, so I knew that I would never get a photograph of the actual swearing in. So I positioned myself close to a screen in order to capture the moment. Fujifilm X-Pro2 with a Fujinon XF 23mm f2 R WR, 1/320 @ f5.6, ISO 200. Same thing for the Fujinon 16-55mm F2.8 R LM WR lens. Again a great lens, but also large and heavy. While I only borrowed this lens, I noted the good and bad when I wrote about it following a visit to Grand Central Terminal. The search continued for that perfect everyday carry-around lens. Maybe you have guessed by now which lens I've finally chosen. In fact, it was a lens that I shot with for almost two years and loved, I just didn't realize it, or maybe I was in denial. Or maybe I'm just slow to catch on. The 23mm allowed me to capture this moment between two first time inauguration attendees while moving in the crowds. Fujifilm X-Pro2 with a Fujinon XF 23mm f2 R WR, 1/300 @ f2.8, ISO 200. Whatever the case, the lens, of course, is the Fujinon XF23 F2 R WR. For two years, I used that focal length on my Fujifilm X100S. Street photography, landscapes and everything in between, that was my go to lens. Of course, it was the only lens, since it is fixed on the X100S. The point is that not given a choice, I found that the 23mm (35 equivalent) was the perfect lens. So for the past three weeks, starting with the inauguration, I've only used that lens and I've fallen in love all over again. It's small, light and seems to be the perfect focal length to capture both wide overall establishing shots and the up close and intimate shots. The only negative, and it's the same negative that I had with the 16mm lens. Why can't Fuji just provide the right lens hood when I make the purchase? In both cases, I've purchased the upgraded lens hoods; the LH FX16 and the LH FX35-2. The final photograph I made that day was of Barack and Michelle Obama leaving D.C. aboard Marine One. Once again I was looking for crowd reaction to the scene happening on the big screen. Although there is some disagreement, my opinion is the crowds weren't as big as in 2009, but this is the kind of situation, crowds, fast-moving and with plenty of action, that I like, and the 23mm was the perfect one lens for me that day. Fujifilm X-Pro2 with a Fujinon XF 23mm f2 R WR, 1/200 @ f6.4, ISO 200. These are pricey upgrades and cheaper options are available but don't be fooled. In the past, I've recommended some of the less expensive lens hoods, but for the 23mm, like the 16mm, these hoods are very different and while overpriced, are worth it. As a bonus, the LH FX35-2 will fit both the 35mm and 23mm lens. Lens hood issue aside, the 23mm is very sharp and in my opinion the best all around lens to pair with my X-Pro2 for a wide range of photography. The 16mm and 35mm are by no means obsolete but are no longer carried with me every day.